1973 North Dakota Inspection Sticker - $20.00 : Bob Hoyts Classic Inspection Stickers, Add a Final Touch to your Restoration! 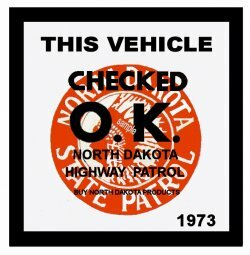 North Dakota did not have inspection stations like California, the higway Patrol had spot checks and issued stickers to show the car was safe. We would like to pay $25.00 for any original that you may want to sell us that do not appear on this site. We will also produce a free reproduction for any good photo, (Front and back) that you send us. We will also pay $10. for a front and back scan plus a free reproduction for any sticker not shown here. This 1973 North Dakota Inspection sticker was carefully restored both front and back keeping true in color and size to the original. It has our patented "Peel and Stick" feature which allows you to attach it to the inside of your windshield.